Hviids vinstue is situated in the basement in Kongens Nytorv 19. The interior is rustique, and the spare lighting in the dark rooms gives it an intimate atmosphere. You can get three open sandwiches for DKK 68,- (€7), and the beer and the Gammel Dansk Bitter is reasonably inexpensive. If we had not made up our mind, I would have liked to have enjoyed my danish "smørrebrød" at Hviids. But the Carlsberg and the Bitter tasted great. Do visit Hviids vinstue. 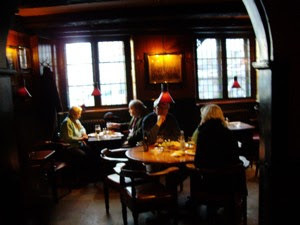 It has a wonderful old world ambiance, and represent what is the typical Danish way of life.